Son of Mrs. Ruth Tanner, of 73, Englands, Chippenham, Wilts, and the late Frederick C Tanner. The men of Wiltshire have taken a glorious part in the titanic struggle now raging. Week by week the list of honoured dead grows longer: but 'Who dies if England live?' We give below the portrait of four more Wiltshire heroes whose lives have been gladly sacrificed in the sacred cause for which the Allies are hourly pouring out their blood and treasure. The honours of war have their greatest realisation on the battlefield, but among those who have gone forth to serve King and Country and are doing so with equal keenness and devotion, there are many who fall by the way and give up their lives in the service of their country, the victims of disease or injury. To the number of those who have thus crowned their service by sacrificing their lives must be added Trooper HA Tanner, the news of whose death has been received with great regret, and has drawn forth sympathy with the bereaved parents and members of his family. 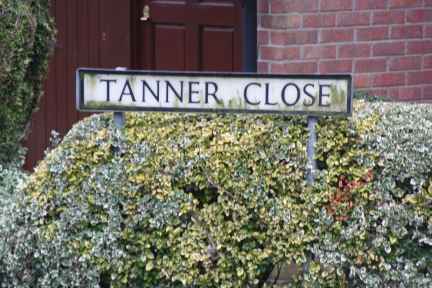 Trooper Tanner, who had only just passed his 21st birthday was the second son of Mr and Mrs FC Tanner of 73 Woodlane, Chippenham. As a boy he was a pupil at the Westmead School and was a member of the Church Lads Brigade and Boy Scouts, He showed considerable talent for sketching and painting and was an enthusiastic angler, being a member of the Chippenham Angling Club. He served his apprenticeship with Mr T Hamblyn, dentist, Chippenham and about eight months ago joined the Royal Wiltshire Yeomanry. Trooper Tanner came from a family of soldiers, being the grandson of Colour Sergeant F Blanchard of the 54th Northumberland Fusiliers and later of the permanent staff, Devizes. After service at Chippenham he was stationed at Tidworth and about Easter last, he was attached to D squadron, RWY and sent to France where he served some time at the base at Rouen. Later he moved nearer the firing line and wrote stating that he been through an interesting and exacting time under shrapnel. Later he had the misfortune to meet with an accident, being kicked by a horse. Serious complications ensued and he was removed to hospital and then sent back to Rouen. The doctors first hoped to be able to get him well but after a week in hospital he grew worse and the end came suddenly on August 14th. Deceased was buried the following day in the cemetery at Rouen and was accorded full military honours. All who knew him regret his death and none more so than his schoolmates and companions both in civilian life and in the Army for he was of a bright and cheery disposition and a good comrade. In ever cherished memory of Tpr HA Tanner (Dear Bert) who died in the General Hospital Rouen August 14 1916 aged 21. For thee the hand of death did not unlock the golden gate. In loving memory of dear Bert who died at Rouen Aug 14 1916. We loved thee well but God loved thee best. In ever loving and cherished memory of Trooper Herbert Arthur Tanner (Royal Wilts Yeomanry) who served his King and Country in France and died in the General Hospital, Rouen August 14th 1916. Yet, recognising Thy higher gain, how could we wish you back again? And hearts made sad through parting here are there again made one. From his Mother, Father, Brothers and Sisters.